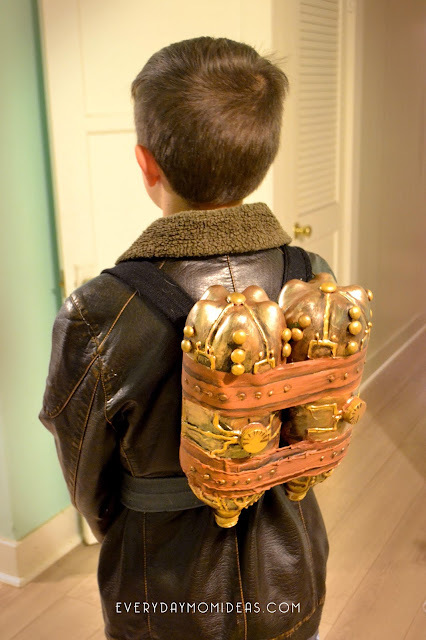 This Steampunk jetpack takes a few days to make due to drying time but it is really simple, easy and cheap to make. 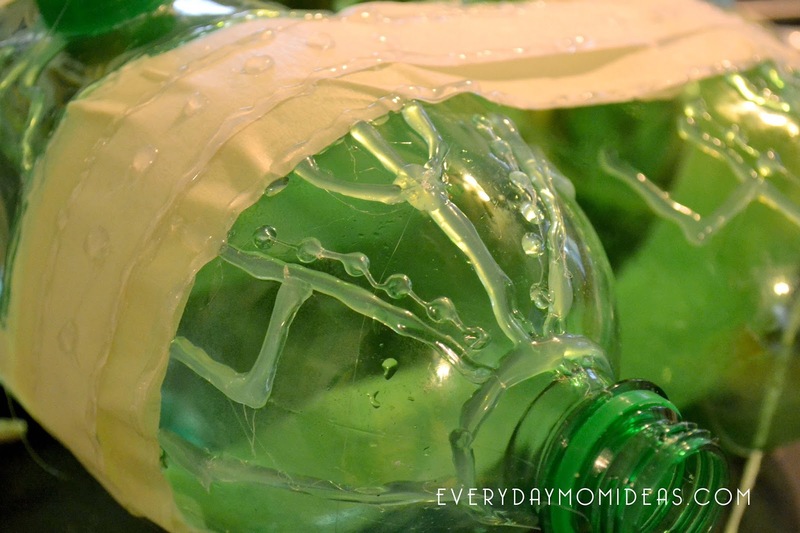 We made ours for no money using two soda bottles and a bunch of little bits of random things around our house.... plus the awesome power of the glue gun. 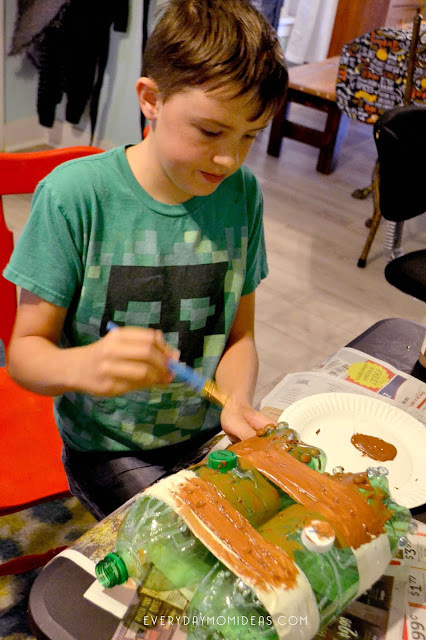 You could probably make yours for under five bucks because all you need to buy is painters tape, glue sticks, and craft paint if you don't already have them. This Two Litter Jet Pack is probably best as a young teen or child size. If you want to use it for an adult I suggest adding extra stuff to the side to make it seem larger. Like maybe cardboard wings that look like metal. But these are perfect for big kids or teens. 1. The Bottles: Glue the two soda bottles together with a hot glue gun. 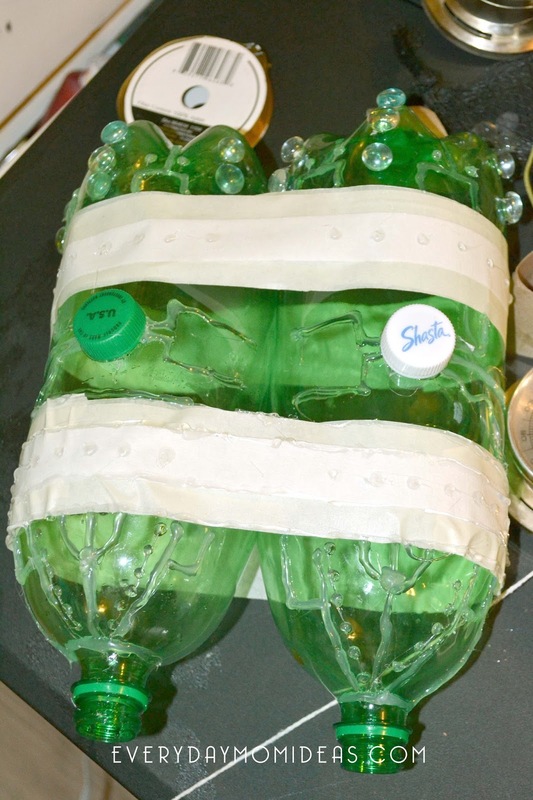 Then for extra reinforcement and decoration use the painter's tape to strap around the two bottles. You can be very generous with the tape and double up or triple up the layers of tape. TIP: I did two strips of tape side by side and then one strip on top to create a fun custom leather look for when I paint the jetpack. 2. 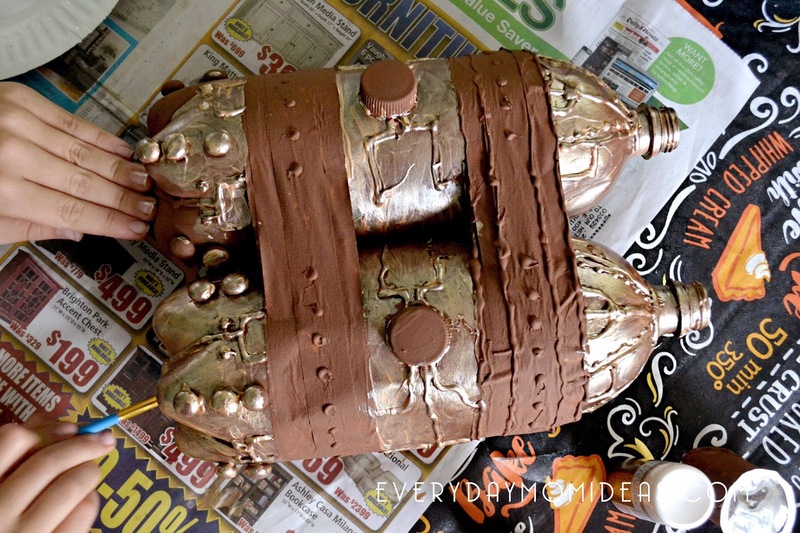 Wires & Rivets: Some people use wires and string to make the electrical effect on their jetpacks but you don't need all that extra stuff if you have a glue gun. 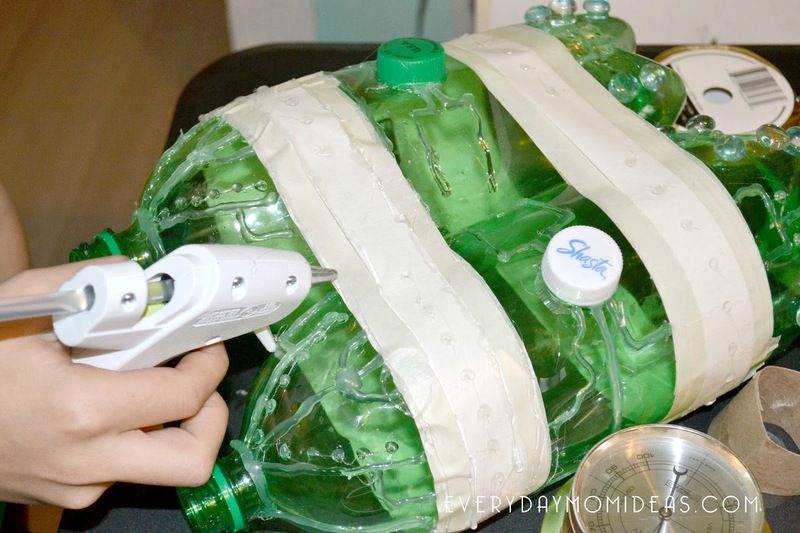 Use the glue from the glue gun to add all that fun electrical detail to the jetpack. This is the most fun part and you can get really creative here. You can make rivets and wires and all sorts of details just by using the glue. 3. Knobs: I used the lids as knobs and found some flattened marbles for some more rivets and buttons. 4. Paint: Now it's time to paint! 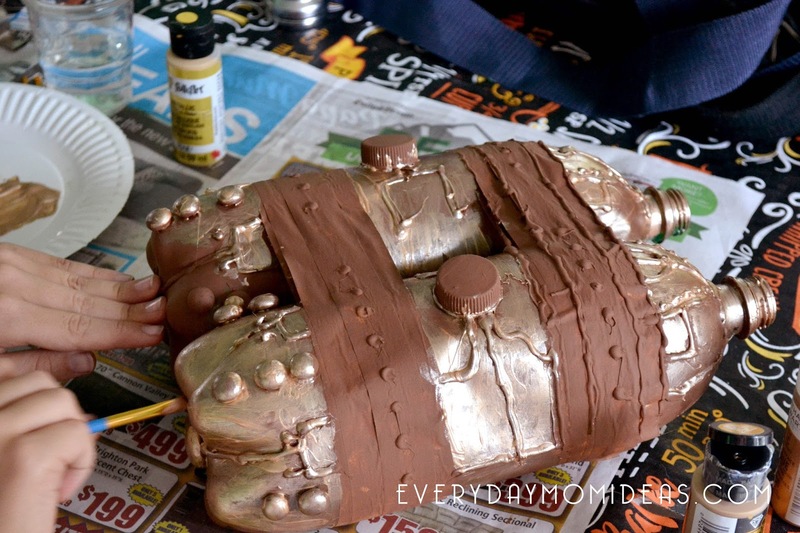 Paint one base coat of brown to the entire jetpack. You can add the gold and paint detail later. 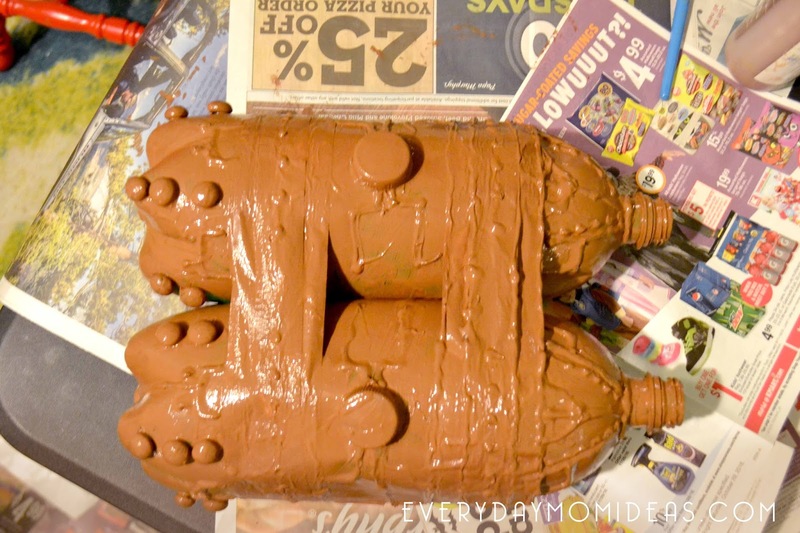 The jetpack will need at least two to three layers of the brown paint on. Let dry overnight. 5. Painting The Details: When its all dried you can paint with the light tan-gold paint. Because you painted the base coast with brown the gold paint will go a lot longer. Also, you don't want to cover up too much of the borwn with the gold paint. Let the brown show through a little bit to add dimension and that rusty metal look. Leave the tape brown to make it look like leather. Tip: Paint the brown on top of the gold around the wires and rivets to help them stand out and give them a more 3D effect. You can also paint the wires and rivets the darker yellow gold to help it stand out even more. 6. STRAPS: For the jetpack straps, we used these old fabric weaved belts the boys had from when they were little that they don't fit anymore. 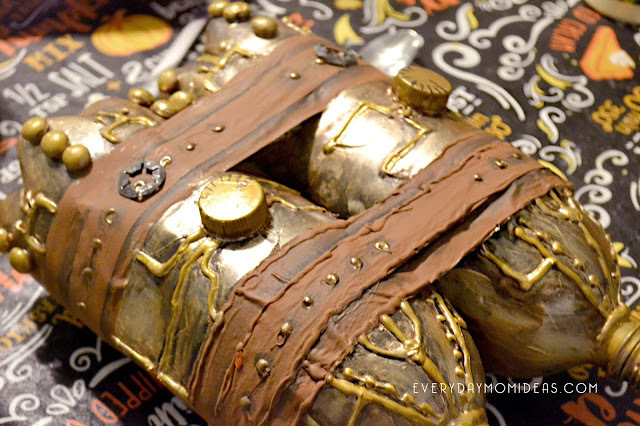 These make very cool belt staps because they look real and the buckles are a nice touch. 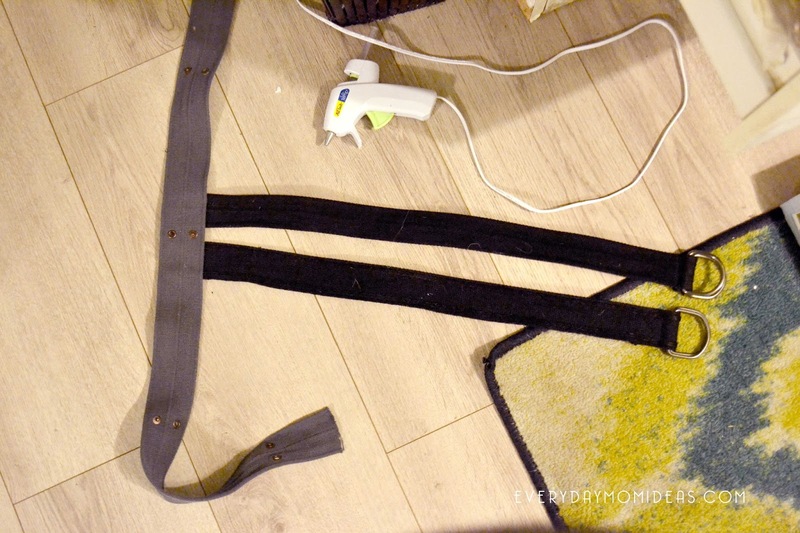 You can also easily replace the fabric ones for duct tape belt staps. Duct tape is amazing. Just double the tape up so there is duct tape on back and front and you have your straps, no sewing involved. 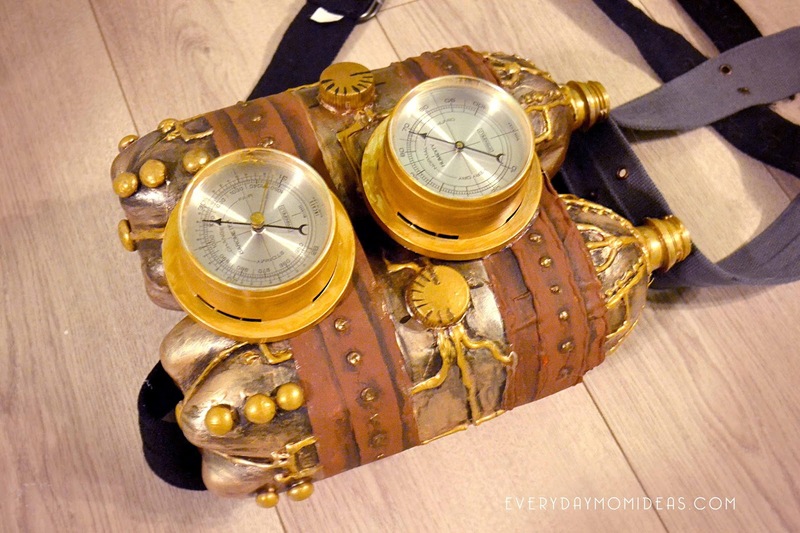 At this point, you have a great looking Steampunk Jetpack. You can go ahead and use it just as is or add some extra bling. We found this old wall mounted barometers at a thrift store for $2 and took them off the wall mount and on to our jetpack. They were the perfect addition. Add this to a bomber jacket and you are ready to go with a steampunk look. We added a steampunk cowboy hat and wrist gadget to this look for just a few dollars more. Let me know how your jetpack works out or if you have any questions. I'm happy to help. Please share this Pinterest friendly image below with your friends and family or save it for later.